One of the most common mistakes people make when housebreaking their dogs is giving them too much freedom too soon. 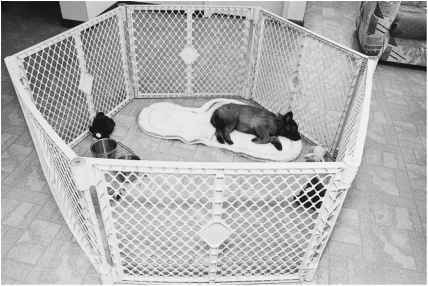 If your 7- to 12-week-old puppy is having more than one accident every three days, you are giving him too much freedom. The same holds true for a three- to five-month-old puppy who is having more than one accident a week, and for a dog over five months old who is having any accidents. 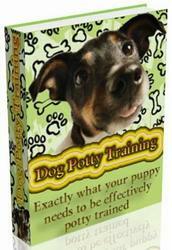 A good time to give your dog more freedom is right after you have taken him out and seen him relieve himself. If he is in the 7- to 12-week age range, limit this to 15 minutes to half an hour, and keep him in one room. When he looks like he is about to take a nap, put him back in his crate and shut the door. Gradually give him more time out of the crate and access to more rooms, one room at a time. The use of expandable baby gates is invaluable. They come extra-tall and extra-wide, and can even be double-stacked if your dog is a good climber or jumper. If your dog has an accident, you've given him too much freedom and need to cut back. There can be a problem with confining your dog too much. For example, a puppy kept exclusively in a kitchen until he is six months old may not regard the rest of the house as part of his home that he instinctively wants to keep clean. While your puppy is young, or while you are in the process of house-breaking an adult dog, it is wise to give him brief, supervised access to whatever rooms in the house the dog will be allowed in when he is housebroken. You will also want to try giving your dog more freedom when you are away from home. Again, start with one room. Try it when you are going out for a short errand. Slowly extend the time you leave your dog alone, and add more rooms. Do not assume that because your dog is housebroken in your house, he will not eliminate in other people's homes. Even if he is perfect at home, restrict his freedom in other people's homes by keeping him on leash until you are sure you can trust him. It is best to avoid mortifying experiences, like the time our young male dog lifted his leg on my sister-in-law's Christmas tree!